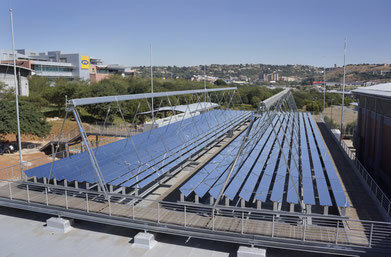 Solar thermal cooling allows reducing power consumption and electricity costs. Due to the fast growing cooling demand, solar solutions will become an important pillar of cold supply. In industry and commerce thermal driven absorption chillers offer attractive opportunities when they are powered by solar thermal collectors or waste heat. Read more about one of our solar cooling projects here. How Does Solar Thermal Cooling Work? Absorption chillers are driven by heat and thus have a very low power demand. Heat, captured in solar thermal collectors, powers the cooling cycle by separating a refrigerant from a carrier material. When the refrigerant is later evaporated it provides cooling by withdrawing heat from the environment. Below more information about Industrial Solar cooling projects. What Are The Advantages Of Solar Thermal Cooling? We offer solar cooling solutions, our state-of the-art, Concentrating Solar Linear Fresnel technology ... Download the PDF to read more about us.